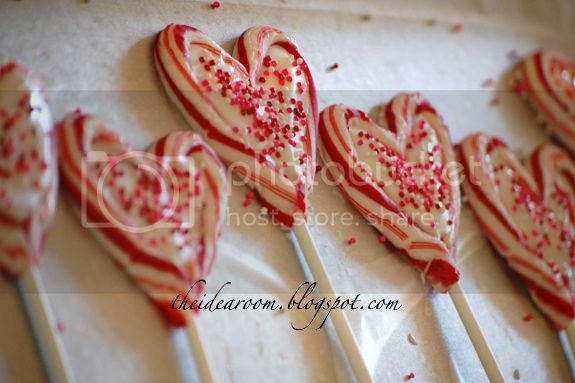 Want to make these fun Candy Cane Heart valentine lollipops? They are really easy, fun and make the perfect small gift! 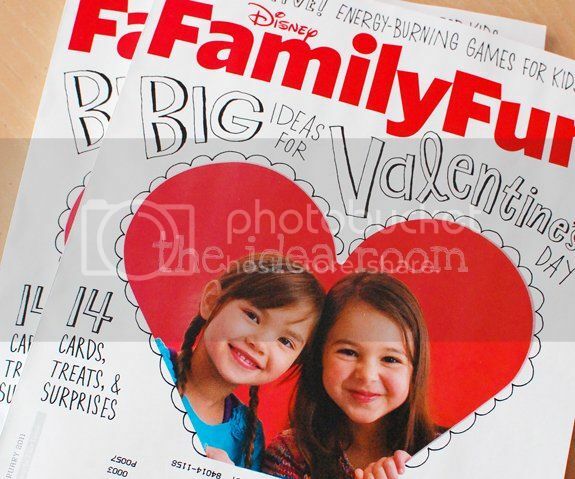 I shared with you the other day about one of my ideas being shared in the February issue of the Family Fun Magazine. Thanks for all your fun and kind comments. And now that the issues are in the store I can share with you exactly what it was…although MANY of you already figured it out ;)! 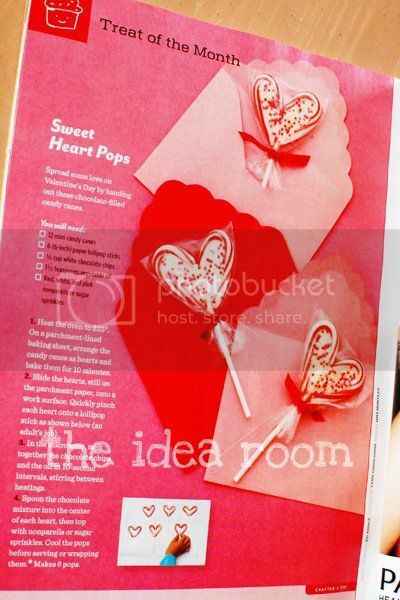 I was contacted back in September by one of the Family Fun editors asking if they could use my Candy Cane Heart Suckers in their 2011 Valentine’s Day issue. They had found my idea circulating the web. Pretty fun for me as I had been a big fan of their magazines for a few years now. I thought I would share it with you just in case some of you don’t subscribe to Family Fun. 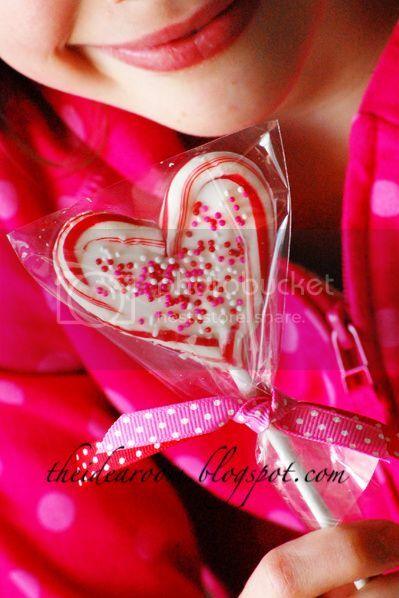 And if you would like to make some for Valentine’s Day, here are the directions. 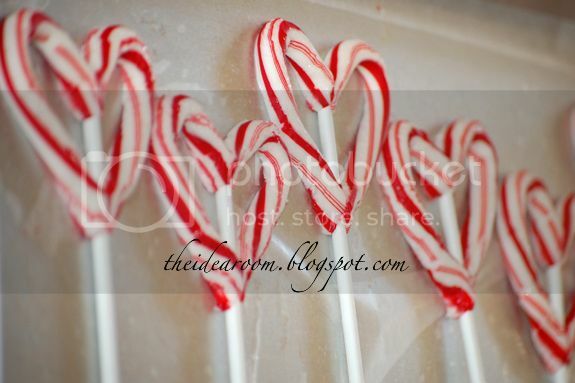 Simply take two (per sucker) small candy canes and place them on a greased cookie sheet in a heart shape. Slide a sucker stick in between them like you see in the picture. Place them in a heated 350 degree oven and watch them closely. After 3-5 minutes, they will be melty and bubbly. 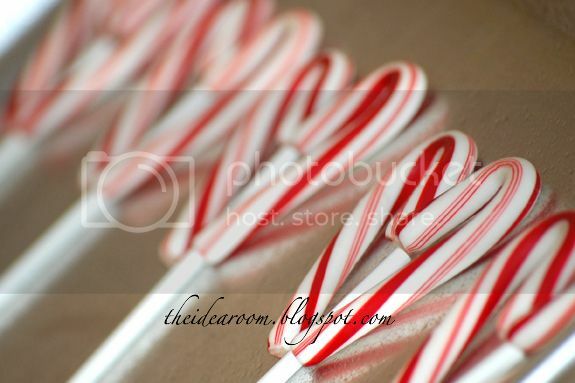 Quickly remove them from the oven and pinch the ends of the candy canes together at the top and bottom of each sucker. Be very careful as the candy will be HOT! Then set the tray aside to cool. After they have cooled completely melt some white chocolate or almond bark in the microwave. Pour a small amount into the center of the suckers and smooth with your clean finger. I added a few colorful sprinkles as well. Let them cool again before packaging or better yet…Eating! Second of all, I can now get rid of all our extra Candy Canes- WAHOO!!! I am not very crafty, although I like to keep an eye on blogs and websites for ideas that maybe I can will be able to do one day. This is one I really feel like I can handle! Thank you for sharing this. It's perfect. And congrats on your magazine appearance! Wow! Congratulations on getting in family fun! Thats fantastic!And that is one the cutest ways I have seen yet to use up all those left over candy canes from Christmas! Congrataulations on being in Family Fun. These are so cute. What a great idea. Congrats, Amy! What a clever idea. Looks delicious. I saw that in the mag. They look so cute? My only problem–where to get mini candy canes now that Christmas is over? Congrats on the magazine! That is so awesome!! I love this idea. However, I have been EVERYWHERE trying to find those mini candy canes. it is driving me crazy. Everyone has the larger ones! I always buy some mini candy canes at Christmas and save them. But that doesn't help you now! I know you can buy them from Amazon right now but remember them being a bit pricey. If anyone comes across some, give us a shout out so we can find some too! I searched and searched through the magazine to see what you made and the only thing that I thought you did were these. I didn't see your name anywhere on the page so I wasn't sure. Congrats that is so COOL! Again, congrats! Keep the cute ideas a coming. congrats! I heart family fun and your heart suckers AND YOU! Yea – congratulations on your idea! It's so funny that this is the only page that I tore out from the magazine. I am so going to make these. How awesome to be featured on Family Fun! We just got ours yesterday and my kids always turn to the back to make the treat of the month! This is awesome! so so so so so so so so so so exciting!!!!! Congrats Amy!! I'm in that issue too – page 13!!! Pic of the family from Halloween featuring my Princess Leia Yarn Wig. I got my magazine in the mail today! YAY!!! Congrats!! 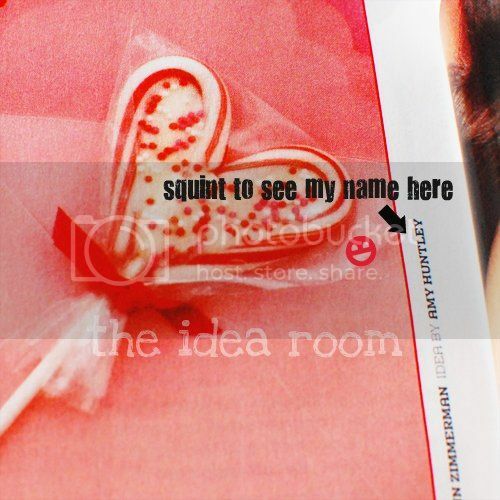 I saw these in the online version of the magazine and just knew that they were your idea! Congratulations on being in Family Fun! How exciting for you! It's a cute project. Oh my goodness, these are the cutest things I have seen in awhile!! Look at you! These are adorable! I will be trying these! Yeah for you!!! That is so fun! awww :) Congratulations!! I can't wait to try this! Wow! You are now famous! Published! Sought after!! Yay!! And those look like so much fun. Now, if I couldn't only find some candy canes…no wait…I have a bazillion in my pantry. Its really great, this blog has got really very great article. Ha! I thought that looked familiar. Good for you! Seriously adorable and too clever! Congrats on the feature…I just received my magazine in the mail today. So glad you are a DIY CLub Dare blogger too…I cannot believe O wasn't following you before (how the heck could that have happened)! Congrats again. Saw it in Family Fun…was one of my favorite ideas in the magazine..WAY TO GO, GIRL! Congrats! They are so lovely! Saw the valentine candy canes in the magazine last week and thought they were gorgeous – So happy to see it is creative you who made them! First, I want to say I'm so mad at myself for not knowing that was you in the magazine! I'm a fan of yours, for sure. Tsk tsk for me! Second, for eveyone who missed out on the christmas clearance of candy canes, I just found mini candy canes on Oriental Trading for around $5. Can't wait to try these out! Hey i loved this idea and wantd to share with youmy experience. I do a BIG Laugh on Fridays on my blog, please go check it out!! If anyone is looking for candy canes, I just bought some from Oriental Trading. You get 100 for $5.49. I am waiting for them to be delivered so I can make these fun suckers for my niece and nephew! These are amazing! Congrats to you for the article…we love Family Fun! I saw these in Family Fun. Congratulations on being featured. I am going to share this idea for a curative article I am writing. I will of course be linking directly to this post and not using any portion in my article. I would like to use a picture and link to send people here so they can make these cool pops themselves. My goal is to help spread the word. Please let me know if this would not be okay. I subscribe to Family Fun and this was my favorite Valentine's Day idea in the whole magazine. Imagine my surprise while surfing around the crafting blogs to find yours here! I had no idea it was from someone outside of Family Fun but now I'm glad I do and that I found your site! Very cool, congrats! These are completely adorable! I actually featured them on my blog as part of my Fabulous Finds Craft and Recipe Round-Up: Valentine’s Edition! Just thought you’d like to know, and thanks for the awesome idea! Love these! So fun to see in Family Fun!!! You say that you should do these on a greased cookie sheet, but it looks like there might be waxed paper underneath the suckers in the picture. Could I do that instead? Making for Christmas with red & green sprinkles! Great idea! Tip: I did this last night and made a few mistakes; hope you can avoid these same ones. Those skinny mini candycanes that are not peppermint (Target sold red, pink and blue (cotton candy and blueberry flavored, for example) ones at Christmas) do not work as well. They melt too fast and don’t hold shape. The thicker mini candycanes work best. In fact the ones that worked easiest were in plastic wrap with the “Legend of the Candy Cane” printed on them. For some reason, those are the perfect thickness. What a fantastic idea! I would not have thought of that. Thank you so much for sharing this! !